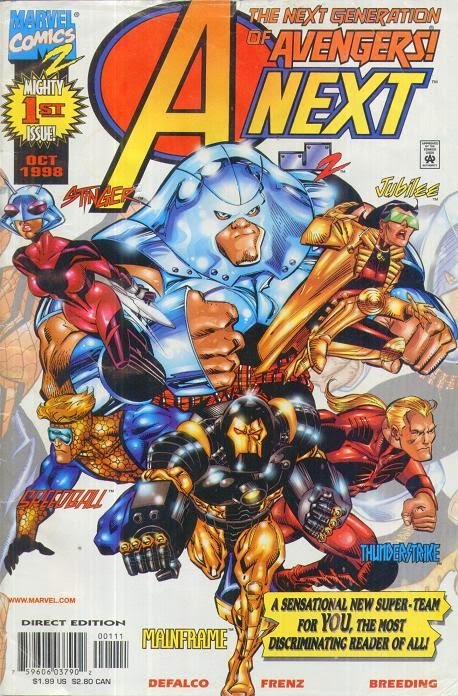 A-Next was a newer younger Avengers team that was launched under the Marvel Comics 2 label. The team consists of Mainframe (a sentient suit of Stark armor), Jubilee, Speedball, Stinger (Cassie Lang, daughter of Scott Lang the second Ant-Man), J2 (Zane Marko son of the Cain Marko the original Juggernaut), Jolt, and T-Strike (Kevin Masterson son of Eric Masterson the original Thunderstrike). This was another issue I grabbed from the 50 cent bin at my local shop. I grabbed it because of how random the team is. It’s a pretty straight forward team building issue, which is both good and bad. It’s good for introducing you to the members of the team. But it hurts it because the story is really thin. Though there are some great character moments hidden within this book. For example at the beginning of the issue Kevin Masterson is called to the Avenger’s Mansion by Jarvis to receive his fathers mace, which was linked to his father so it has no more power. All of the characters get a small introduction and bit of backstory. and the formation of the team all centers around a army of trolls attacking Kevin for his fathers mace. I am interested enough to search Wikipedia for more information on this strange team. You also get to see some familiar faces from the Asgardian realm before all is said and done. The art by Frenz is actually pretty good for nineties art. all of the members of A-Next are easily told apart. And Frenz is one of only a few artists who make Jubilee look asian like she should. The troll army is the only rough point. it is really hard to tell if they are supposed to be trolls or Mongolians.